Saw a 'new' Interceptor R at Prescott the other day. Made by Jensen International Automotive Ltd. the car looked magnificent, every bit as iconic as the original. Fitted with a GM LS V8 producing 429 bhp with a four speed auto box the car can certainly move! It had a gorgeous interior as well. I spoke to the firms boss who told me that 12 cars were either completed or in various stages of work at a cost which varied between about 100K and 180K depending on owners preferences. If there is a market for the Jensen there must surely be a similar market for the S6, it will be interesting to see what Toby Silvertons plans are for the new venture. It will be even more interesting to learn what long term plans Frazer Nash Research have for the Bristol marque. I think the company picked up the Interceptor "S' business which had been running for two or three years until it folded. From what I gather that company got into a spot of bother as when they disassembled the cars the stacked all the stripped off panels, doors and parts from the cars but they got jumbled up so that when it was time to reassemble the complete cars they found that the panels were all slightly different sizes and they ended up with the mother of all jigsaw puzzles. I wonder if some of the 12 orders relate to completing those cars? Clarkson gave them a glowing review, perhaps someone will let him have a turn in a series 6? 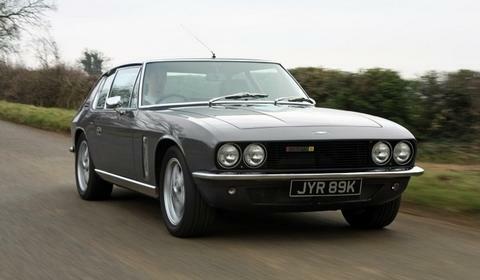 This Jensen Interceptor R looks very much like a 603, to me. I presume the former is a classic restoration and the latter is a new drive train and upgrade as for the S6? Yes, the suspension is also changed. They replace the original leaf-sprung live axle, for instance.